H x W x D: 1140 x 540 x 430mm. Footiron W x L: 300 x 170mm. On two 200mm dia. rubber tyred wheels. 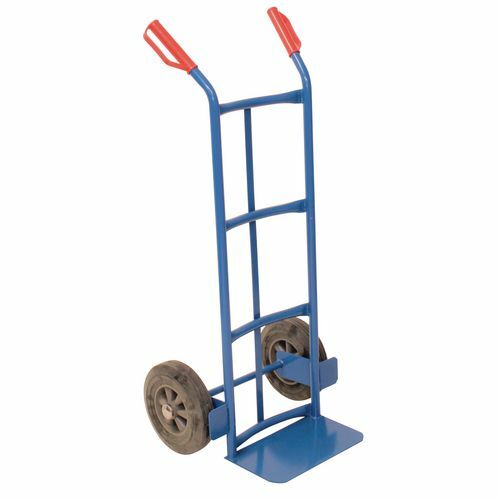 This traditional tubular handtruck has an impressive 100kg capacity and an overall depth of 430mm, height of 1140mm and width of 540mm which enables you to carry large items with ease. It has an Epoxy powder coated finish which means that it is strong and more resistant to stains and scratches. It is also made from steel tubes for extra strength, durability and a longer life span. This tubular handtruck has two rubber tyred wheels with a 200m diameter so transporting all sized loads is comfortable and simple. For your peace of mind, this product also comes with a 12 month guarantee.